From the front of the choir: Do you need singing lessons in order to sing? Do you need singing lessons in order to sing? I often get enquiries from people looking for one-to-one singing lessons. I tell them that unfortunately I don’t offer them. Then I say that I don’t recommend singing lessons in any case, but recommend they join a choir instead. Do singing lessons help people sing better? why do you want singing lessons any way? The vast majority of people who contact me for singing lessons don’t give much background information! There’s none of this: “I’ve been singing in a choir for years and would like to increase my range” or this: “I’m just starting out and don’t know whether I can sing or not.” But on closer examination (and a few emails or phone calls later) it almost always turns out that people are in the last category. She has been “meaning to start singing for years” but just “hasn’t got around to it”. In many cases it’s very similar to those people who’ve been “meaning to write a novel for years” but never quite got around to it. Will they ever get around to it? Will it simply be a flash in the pan? How much do they really want to sing? They only need to open their mouths and let the sound out! To be fair though, there is a huge group of people who love singing, maybe sing around the house or in the car, who maybe were even in a choir at school, but have not sung with a group before (or at least, not in a long time). They may feel comfortable and confident when singing alone, but are nervous about singing in front of, or with others. That’s when all the doubts crowd in: maybe my voice isn’t as good as the others; perhaps I’ve been kidding myself and I can’t really ‘sing’ after all; it would be terrible if I inflicted my voice on other people and it turns out to be awful; maybe I can only sing along with my CDs and am not able to learn ‘proper’ songs with other people; I don’t know anything about music, so I’ll be a fish out of water. We’ve met these people before. They’re often the people who think they can’t sing (Why people think they can’t sing, But I can’t sing that high!) or who love singing but never actually get it together to join a group (I love to sing, but I’m not leaving the house!). Many people in this situation (i.e. choral ‘beginners’, those with not much experience of singing with others) are drawn to the idea of having singing lessons. They think the lessons will improve their voice, teach them to sing ‘properly’, give them feedback on whether they sound OK or not, introduce them to music theory, turn a ‘singing at home’ voice into a beautiful choral voice. In many situations though, this is simply putting off the inevitable. It’s rather like people who want to write that novel and keep buying “How to write novels” books, but never actually get round to picking up a pen! There is no easy way to walk into a room of strangers and sing with them. There is no preparation that can help this step into the unknown. In fact, having a singing lesson is probably even harder than joining a choir! OK, so you’re feeling a little under-confident about singing with others. You’re not sure whether your voice sounds nice or not and you don’t know if you can hit the high notes. You’ve been singing round the house for years, but nobody (except the kids and the dog) has actually heard you. What’s the next step? Why not pay an experienced professional singer (who knows much more about music than you do, who can probably sing much better than you, and who has years of experience of performing in front of vast audiences) to give you some of their time so you can stand in front of them and sing solo for the first time? No problem! Easy as falling off a log. In my opinion this would scare any beginning singer to death! It’s not even as scary as singing in front of your friends since they don’t know much about music any way. This is an expert who will be able to hear all the little things you do wrong, who’s sung with some of the best voices in the business. Even if they’re the kindest, most sensitive, caring teacher in the world and really want to help you, what can they do? If you’ve not sung much before, you won’t be that familiar with your own voice or how it connects with your body and breath. You also probably won’t know much about music theory. The singing teacher might start to say things like “lower your larynx”, “make sure your diaphragm is engaged”, “sing me a minor scale”. These won’t mean much to you, and even if they do, you won’t have had the experience to put them into practice in a way that means something to you and can help you improve. But if you join a choir, you are just one of many. You are not put on the spot or asked to sing solo (unless you want to). You can spend many happy months or years singing with others and slowly learning to feel your away around your own voice. You will feel supported (you’re not the only one singing your part, nor are you the only one lacking in experience or confidence) whilst you gradually extend your range and the possible comfortable sounds you can make. You can be playful in the warm ups and discover more about how your voice works, how it feels, and how it connects with your breath and body. By singing a variety of songs, you will slowly start to pick up some musical jargon (minor and major, scale, interval, legato, 4/4). They might not mean much to start with, and it’s not necessary to know this stuff, but by experiencing the music and then connecting it with some of these new terms, it will slowly begin to make sense and add to your musical vocabulary. time for a singing lesson? Once you have sung with others for a considerable time, you may come across a limitation in your own singing. Despite all the warm ups and voice training that the musical director weaves into each choir session, it is not possible for them to give everybody individual attention. So even though your breath control and range have improved since you first joined the choir, you feel that there’s still room for more improvement. 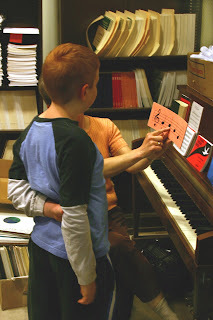 Now if you decide to go for one-to-one singing lessons, you are in much better position to learn something. You will be more familiar with your own voice so will be able to make more sense of the subtle instructions that the singing teacher will give about posture, alignment, diaphragm, etc. You will be able to feel and appreciate the difference these small changes can make. You will feel much more comfortable singing solo in front of the teacher and you will also not be phased if she uses any musical jargon. If there’s something you don’t understand, you will feel confident to ask for an explanation. In short, you are now in a much better position to learn more about your own singing voice. Whatever you might learn from one-to-one singing lessons, there is a whole set of skills that you need that can only be learnt in a group. For example, it’s not possible to sing three part harmony if there are only two of you! My next post will be on the subject of how to be a good choir member, and the week after that I’ll be looking at the skills that I believe are necessary when singing harmony with a group of singers, whether it be in a large community choir or a small ensemble.